BATTLE GROUND — A divided Battle Ground School Board voted Monday night to move ahead with converting Maple Grove K-8 into a K-4 school, shifting 5-8th graders to Tukes Valley and Daybreak schools farther north. The board began by voting to eliminate the N.E.W. Adjusted option, due to a lack of support from parents for the concept at three public forums and through an online survey. Support for the Maple Grove K-4 Conversion and the Southern Shift options was much more closely divided. Nickels and board Vice President Ken Root supported the Southern Shift, saying they felt it would spread things around more evenly, rather than disrupting Maple Grove again. Maple Grove became a K-8 school seven years ago as part of the Bush Administration’s “No Child Left Behind” policy, which required underperforming schools to make drastic changes. It has been the only K-8 school in the district, while educational models have increasingly gone to separate primary and middle schools. 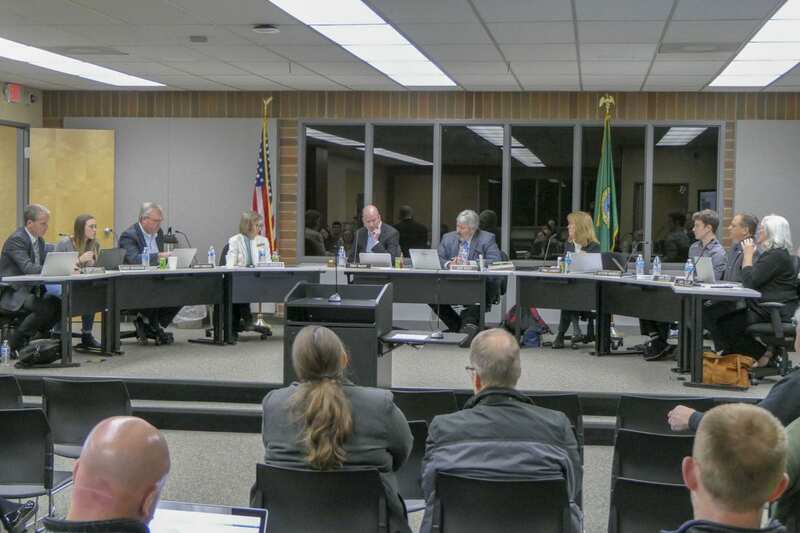 “I think seven years ago Battle Ground created an uneven system in having one building that’s a K-8 campus,” said Superintendent Mark Ross, when pressed for his view on the two choices, saying from an educational system standpoint he favored the K-4 Conversion. “It allows those students from Maple Grove to have opportunities that they might not be able to have with more peers at their other schools,” said Ross. Board member Monty Anderson said he felt the move to K-8 at Maple Grove had been a largely successful one, but agreed that didn’t change the fact crowded southern schools need room to breath. “Due to the growth that we have now, and the lack of the ability to build additional facilities, I myself am not in favor of the southern shift,” Anderson said. While the conversion means many middle school students at Maple Grove will no longer be able to walk to class, and face a longer trip to school, it may actually afford them more opportunities. 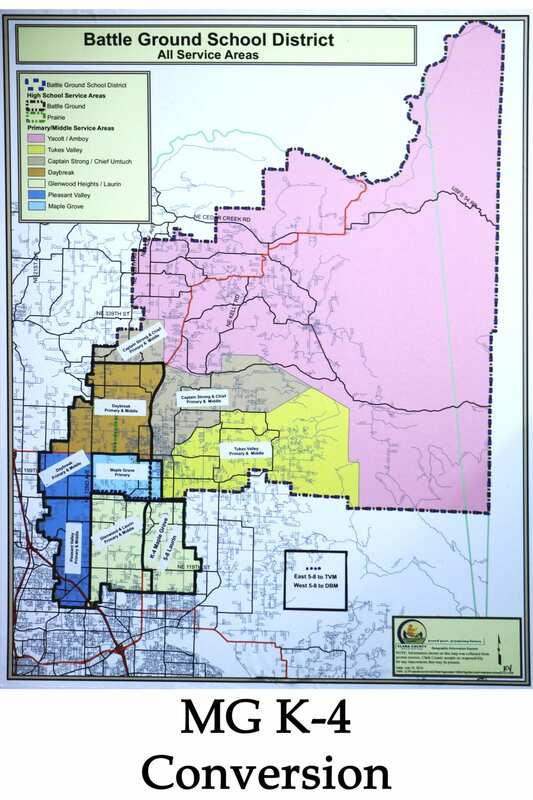 “One of the unintended perks of the K-4 is that it balances the middle and primary numbers at both Tukes and at Daybreak,” said Deputy Superintendent Denny Waters, who oversaw the process of gathering options for boundary changes. The board first voted 3-2 against the Southern Shift, with Nickels and Root supporting the idea. Nickels then decided to support the K-4 Conversion plan, while Root was the lone no vote. The K-4 Conversion will affect approximately 487 students, with around 243 Glenwood Heights Primary School students moving to Maple Grove, while that school’s middle schoolers move to Daybreak and Tukes Valley. Plans are underway to allow students who will be transferred to potentially take a field trip to their new school. The district also plans a series of open houses for parents and their children to see their new school, meet the other students, and ask any questions. They are also hopeful that a small number of boundary exceptions might be able to be granted for students who wish to remain at their school. 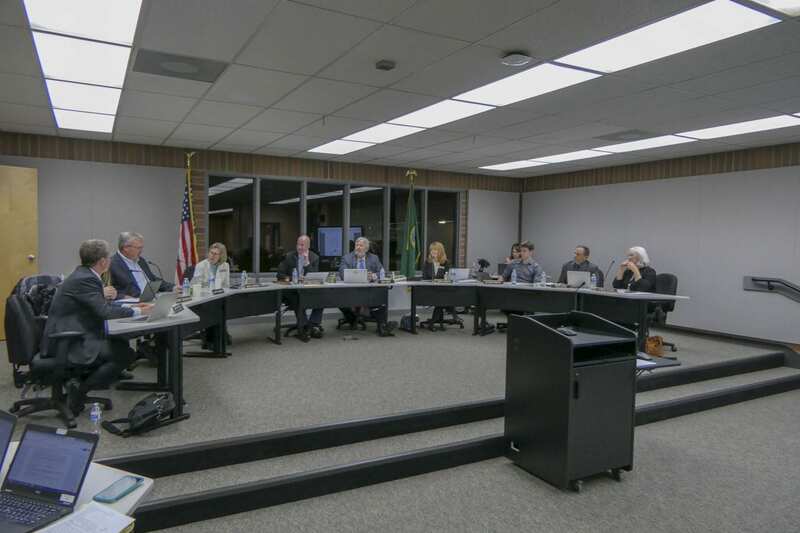 The board’s decision caps months of work, starting shortly after voters once again failed to pass a building bond for the district. A report commissioned by the district from E.D. Hovee & Co. estimated that growth in the southern part of the district could see as many as 2,740 new students enter Battle Ground schools within a decade, with most in the southern part of the district. Similar estimates for other parts of the district have failed to pan out, but the Glenwood and Laurin campus was already over capacity.